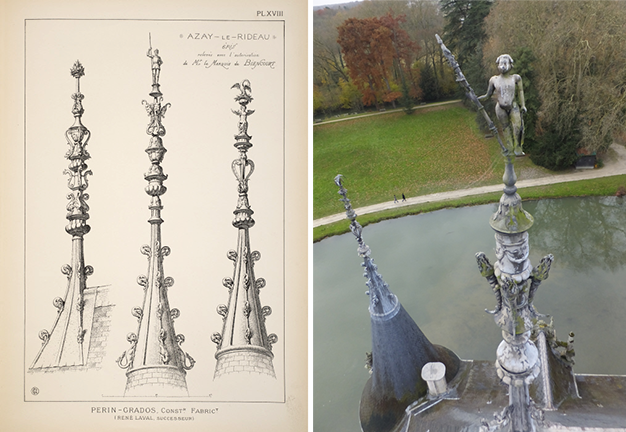 Contribute to the restoration of the Château d’Azay-le-Rideau finials, a rare, major decorative element of this jewel of the Loire Valley! BRING YOUR SUPPORT TO FRENCH HERITAGE! The cost of restoring one finial is around 10,000 euros. The first phase of restoration concerns four finials. We have already raised half of the funds. If you make a donation to the Château d’Azay-le-Rideau finials, you will be one of the first guests to be able to come and see the Château in its full glory, once the restoration is complete. The large finials on the corner turrets and the slope of the roof are the oldest, with an average height of six metres. Their condition and manufacture lead us to think that they might have been made or fully reworked from older elements in the first half of the 19th century, on the instigation of the Marquis de Biencourt, then owner of the Estate. The Château d’Azay-le-Rideau finials have been damaged by rust and various types of corrosion and so need to be consolidated and restored. The first stage of restoration is carried out after identifying the various metals used in the finials. This is performed by expert roofers. They work on the metal, consolidating the metallic structure and fixing the decorative elements. The restorer then carefully cleans the finial, following specifications to prevent rust and corrosion from recurring. However much you donate, if you wish you can have your name [or the name of a person of your choice] listed on the donors page of the website. > For all donations above €50, you will also receive 1 free entry ticket to the monument of your choice, from the 100 monuments managed by the Centre des Monuments Nationaux. > For all donations above €100, you will also receive 2 free entry tickets to the monument of your choice, from the 100 monuments managed by the Centre des Monuments Nationaux. > For all donations above €300, you will be invited, with the person of your choice, to the inauguration of the first phase of restoration work at Azay-le-Rideau, in the presence of the restoration specialists and the Director of the Château. > For all donations above €600, you will be invited, with the person of your choice, to attend a private demonstration at the restoration workshop. > For all donations above €1,000, you will become a member of the Centre des Monuments Nationaux sponsors club and will be invited for one year, with the person of your choice, to our unique events all over France (Invitations to Monuments en mouvement, Monument en musique, exhibition previews, etc.). *Our invitations do not include transport and accommodation. This project has received an award from the Fondation d’entreprise Banque Populaire Val de France. It also receives sponsorship (in kind and skills) from AXXESS groupe digital, Loire Vision, Green Pub and ITF imprimeurs. > To find out more, visit the page on the works taking place at the Château d'Azay-le-Rideau.